It is a bank with a difference as it does not deal with money but with clothes one of the basic human needs after food and shelter. "The main objective of Goonj, the 'clothes bank' was to provide clothes to millions of poor and needy people facing great hardship, indignity besides health risk due to lack of proper clothing in far flung areas of the country," said Anshu K Gupta, founder Director of the decade old Goonj, while addressing the CEO Forum at XLRI here. "Countless people suffer across the world due to lack of warm clothing. Even in some parts of India, women face indignity as they don't have clothes to wear while others cannot even take bath as they nothing to change into," Gupta said. "Why is clothing not an issue, a subject to work on?," Gupta asked while regretting that the websites of the most prestigious development organisations, funding agencies, corporates listed a range of issues right from domestic violence to global warning but there was no mention of clothing. "Even though when we talk about the three basic needs roti, kapda aur makaan (food, shelter and cloth), we list only food and shelter and not cloth," he said. Gupta said clothing was not just an issue at the time of natural disaster but a basic need, which needed to be addressed for the betterment of poor and needy. Gupta said Goonj, which had won several awards including the "Indian NGO of the year", has launched a nation-wide movement called "Vastradaan", a unique resource mobilisation initiative providing clothes and other basic amenities to millions of people in the far-flung areas just by turning one's wastage into a resource for another. 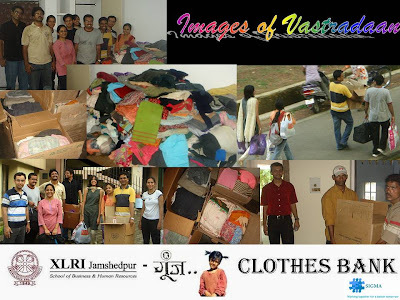 Vastradaan channelises vital resources including clothes lying in excess in urban households to rural India, he said claiming that Goonj had successfully implemented 'cloth for work' programme into a development resource in rural belts in many states including Bihar, Assam, Maharashtra and West Bengal. "We are even setting up new schools without any monetary transaction but just by using old clothes as resource," Gupta said adding that people work for the development of their villages and in return get clothes, not as charity but as a development resource. Referring to the concept of clothes bank, he said this will help us to fulfill the needs of the rural masses round the year instead of waiting for any natural disaster to bring the relief materials including food and clothes in huge quantity. He said Goonj has developed over 30 different products including sanitary Napkin and school bags from waste clothes and papers. Launching Goonj in Jharkhand, Gupta appreciated the Social Initiative Group for Managerial Action (SIGMA), a student society of XlRI, for taking the initiative in launching the clothes bank in the state. Gupta cautioned his new partner that collection of old clothes was not a problem but we have to ensure that the material must reach in the right hands as per their needs. Prof Madhukar Shukla of XLRI said initially, SIGMA will rope in some reputed NGOs to implement it in and around Jamshedpur. SIGMA would set up old clothes collection centres in clubs, cafes, community centres, he said adding that SIGMA had already collected huge quantity of clothes in the XLRI campus during the last couple of days.